After the excitement of the milestone 21st birthday, some people struggle to come up with fun, creative ideas to celebrate a 22nd birthday. Plan a themed 22nd birthday party that is sure to be a success by ensuring that the party plans take into account the personality and interests of the guest of honor. Send party invitations that depict a ballet dancer in a tutu on the front. You can make such invitations look sweet for a woman’s 22nd birthday or funny for a man’s. In celebration of a year of life that features two twos, ask guests to wear tutus—bought, rented from a costume store or made from paper—to the party. Be sure to include Pink Tutus—a mixed drink—on the party menu. Use this recipe from DrinksMixer.com: Combine 2 oz. vodka with 1 oz. Baileys Irish Cream and a splash of grenadine syrup. Shake and strain the ingredients into a cocktail glass garnished with a cherry. Birthdays involving pairs of numbers come along only once every 10 years. Celebrate 22 with a party that features two of everything. For example, bake two birthday cakes, decorate them both with candles, sing “Happy Birthday” twice, and ask the birthday celebrant to blow out both sets of candles. Group balloons together in pairs instead of in bunches. Set out smaller serving bowls so that you offer each snack in two small bowls instead of one big one. Serve two kinds of punch. Give the guest of honor two celebratory tiaras, hats or sashes to wear. 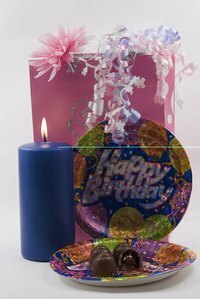 Ask guests to bring two small birthday gifts to the party, as opposed to one larger one. Also, encourage guests to bring paired cards—one that is serious or sentimental, and one that is silly. As a finishing touch, send home pairs of a party favor—for example, two sticks of flavored lip balm or two small bags of candy.